You would be the best player of the classic word game Scrabble if you could memorize the entire "Official Scrabble Players Dictionary." But since it's unlikely you have a photographic memory, this approach to winning is unrealistic. With some strategy and a decent memory, you can become a better Scrabble player and start winning. Learn some tips to improve your chances. These tips are also great for players of the similar online multi-player game, Words With Friends. Consider balance as you look at the letters on your rack. For example, it might be smart to form a word eliminating double letters in your rack even if it's not the highest-scoring move you have available. Many players aim for a rack with four consonants and three vowels. See what letters have already been played before deciding on your move. If few "Es" have been played, you might choose to create "were" instead of "ware," reducing the chance that you'll draw another "E." If you have too many of the same letters that can limit your word building options. Avoid giving other players easy access to bonus point squares, especially the triple word scores. So, gobble up those squares for yourself as often as you can. Plan ahead to play long words, possibly even using all the tiles on your rack in one turn. Playing all your tiles is known as "bingo" and earns you bonus points. The most common letters that players save to create a bingo word are "A," "E," "I," "N," "R," and "S."
Do not fear the "Q." This tile, as well as the somewhat less-frightening "X," "Z," and "J," offers some high-scoring potential. It helps to learn words which use a "Q" but not a "U." For example, "QWERTY," describing a keyboard, counts as a word. If you get stuck with a lot of vowels, think about the word "iodine" and the dozens of other vowel-rich words available. Some words to keep in your back pocket can include "aloe," "cookie," "aikido," and "aqueous." If you have a lot of consonants, there are legal words without vowels like "myrrh," "rhythm," and "tsktsk," for example. 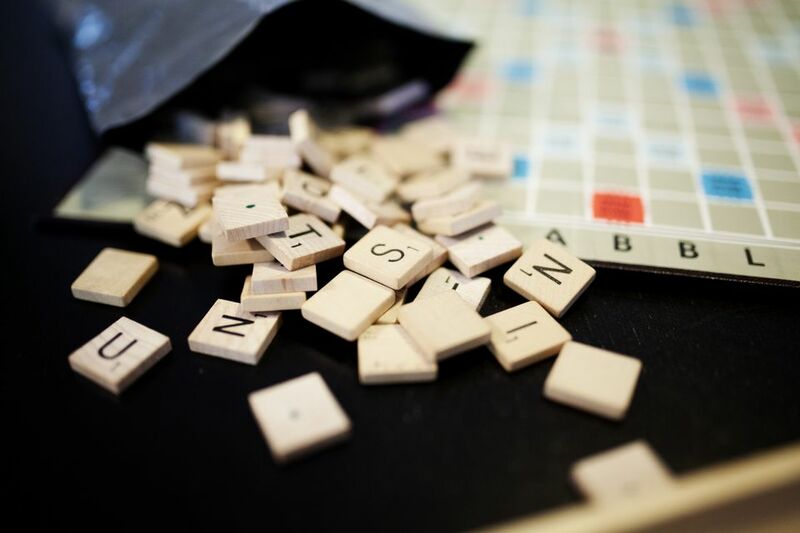 Memorize a few words off a list of vowel-free Scrabble words. To get better at any game or skill, the sure way to do that is play and practice as often as you can. You can buy Scrabble books and a lot of other useful practice tools available online. If you plan to study, then concentrate on unusual words. Keep in mind that a lot of words that you think might not count, actually, do. For example, you can spell out the letters of the English alphabet, like "C," which is "cee," and "F," which is "ef." Don't forget your Greek alphabet, too. So, if you know some fraternity house names feel free to spell them out, like "phi," "beta," and "kappa." Two-letter words can be useful in a lot of situations, especially if it can get you a double or triple-word bonus. "Q" words, "X" words, "J" words, "Z" words and words with a lot of vowels also are good to know, as are the most common longer words.